Includes a fully adjustable wrist brace for greater control & power. Things I liked: The fact that you can adjust the yoke and the wrist band. defiantly the magnetic ammo holder. What others should know: When i got mine started fire it and the leather pouch started to rip so i had to buy a new sling and one thing the sling did not tell me online is that it has a magnetic pouch so if your leather pouches when get the new sling its magnetic. i don't know if this is a problem with all or if it was just a flaw with mine personally. 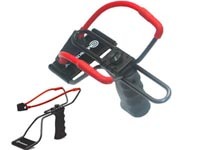 What others should know: It's a good slingshot, and when the red bands wore out I replaced them with the blue crossman bands, it made a good slingshot great. My home in the city has noisy black birds and starlings that like to roost and screech on the telephone wires above my bedroom window. I can put them to rest with this thing.